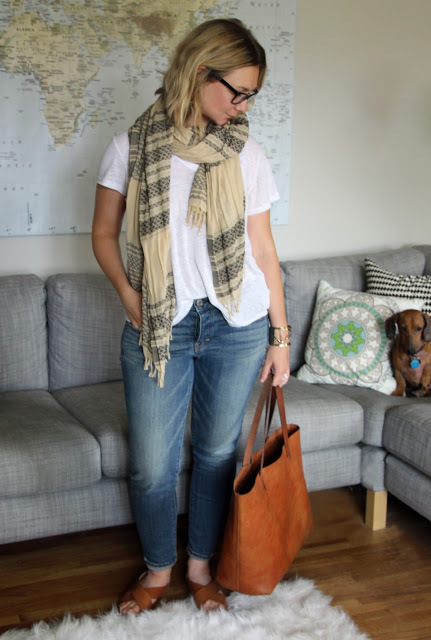 Scarf: Old from Madewell, White T-shirt , Boyfriend Jeans: old from American Eagle. Similar. Gold cuff: old from Forever 21, Sandals: Old Franco Sarto. 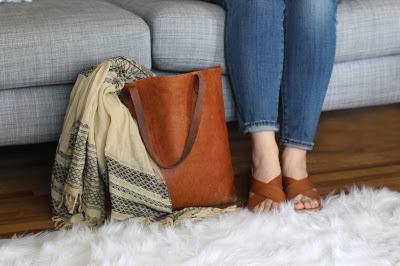 Similar, Brown Tote. This outfit is what started Truncation. Even though I owned so many different styles of clothing, I was continually creating outfits from this same formula because I loved the way I looked in it and it was so incredibly comfortable. Everything else in my wardrobe was just noise, you know? Finally embracing the fact that I am a t-shirt and jeans kind of girl allowed me so much freedom to give up things that I am not (I’m looking at you four inch heels). I love a well cut t-shirt because it is so darn versatile. 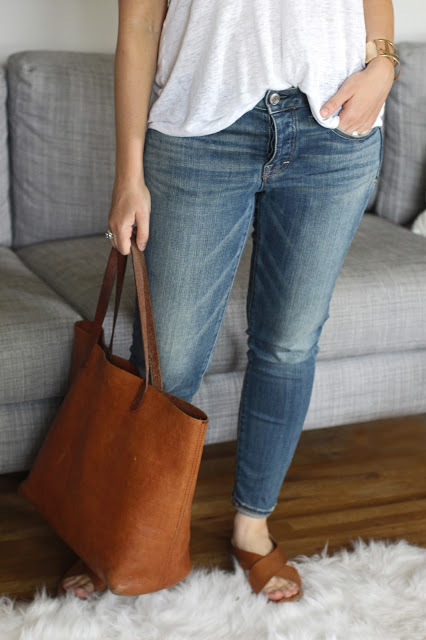 I like it even better when paired with my boyfriend jean like I did here, but it also works equally well with my black jeggings or tucked into a skirt. I’m also a huge fan of adding an interesting accessory to spice things up. I usually reach for a bold cuff and a scarf, but a statement necklace also does the trick. I mean, it’s ridiculous how easy this outfit is. If I can give you any advice as you embark on your truncation journey, it is to pay close attention to your “white t-shirts.” What are the clothing items that you own that you absolutely love? These are the clothes that should be the foundation of your wardrobe. Don’t feel that you need to mix things up just for the sake of mixing things up. It’s okay to have a couple of items that are a bit of a stretch for you (like my green wedges), but you should focus on the pieces that, at any time, you could pull out and feel unbelievably confident in. Don’t worry about fashion trends… just be true to yourself. For me this is a t-shirt and jeans. What is your “white t-shirt”? I’d love to hear!